MIAMI — Coleman Theater books bus tours to see Haitian wood sculptor. 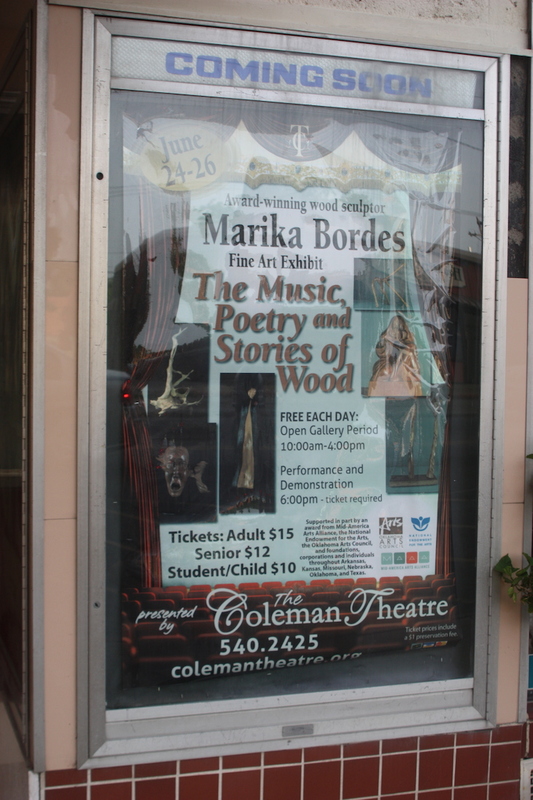 Marika Bordes, from Seguin, Texas, brought 14 of her artistic wood carving pieces, which have been displayed in the grand ballroom on the top floor of the Coleman theater all week. Managing Director Darcie Shultz said when looking for artists to bring to Miami, Bordes stood out among the others. Shultz said the Mid-America Arts Alliance website directed her to five state agencies which had rosters of artists who had been selected to represent their state for touring. The alliance provides grant support for programs like this one. She said she felt the walk-through gallery — displaying Bordes’ art — would add to the experience of the daily tours. The Coleman Theater was one of the stops for a bus tour from Minnesota on its way to a mission convention in Dallas. Bordes was born in Haiti and raised in Montreal, Canada. She said 17-years ago she met her mentor Francois Sanon, a Haitian artist, who works in the Afro-Caribbean tradition. Sanon, she said, helped her realize she had talent. She said she gets her inspiration from daily living. One particular piece called “Carousel of Woman” represents the life of woman. She explained the piece in detail of how she carved each woman on a raft. “The piece begins from youth and how the girl is thinking about her dresses,” Bordes said. “Then she jumps to motherhood where her world is devoted to kids and after one point in life some goes to religion and they cling to an icon, which is why I put the Virgin Mary. Bordes said she always uses woman as her subjects in her art work because woman are the “seed keepers and they direct the world.